I like Les’ Copaque Production’s Upin & Ipin series. Well, actually Nevan & Diego like it, and I simply tag along. Last night as I watched it with the kids, the idea for today’s ink drawing began to form. You see, there is this one particular kid whose story has been written into blog entries by his dad. I vaguely remember this kid posing in front of a big picture of Upin. Or Ipin? Or both? Doesn’t matter. I remember how I found his facial expression resembled that of the picture. 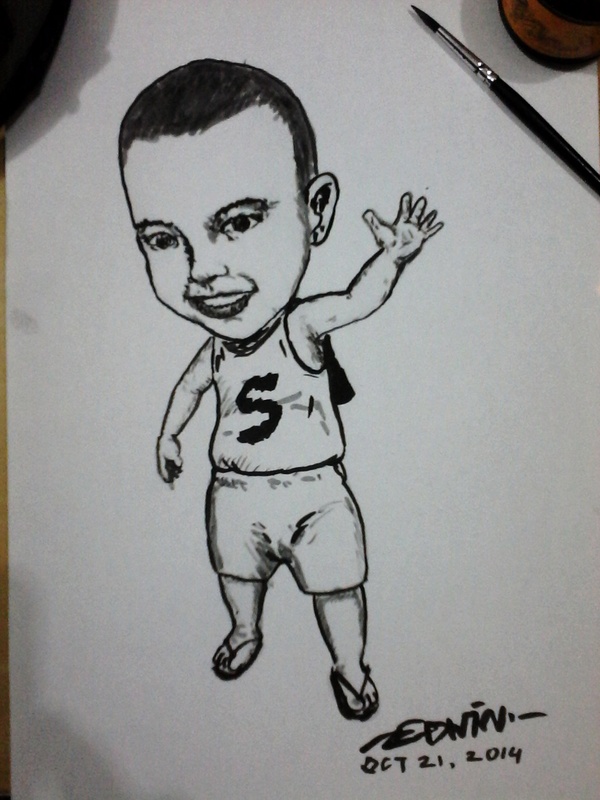 Well, if you can recognize the kid and at the same time think he resembles Upin, or Ipin, or both, it means I did a good job blending him with the cartoon characters. Now, tell me. Can any of you recognize this kid? Or should we wait until the kid reveals himself? ~ by edwinlives4ever on October 21, 2014. Want the scanned image? Just give me your e-mail address and I’ll send it to you ASAP. nanti saya boleh upload di blog saya? Sure, you may do whatever you want with the pic. It’s yours.